The first thing I think of when I hear "WordPress" and "calendar" is the default calendar widget that displays WordPress Posts by date. But WordPress calendar plugins encompass a far greater—not to mention more powerful—array of plugins. There are calendar plugins for events, bookings, and appointments. Some transform WordPress into its own private working app, while others offer the right tool-set to set up a fully functional scheduling and payment gateway. Take a look at these 20 WordPress calendar plugins available on Envato Market and you'll see what I mean. The EventOn WordPress event calendar plugin is an excellent turnkey solution that doesn't skimp on features. It has a clean, minimal design, and you'll be up and running quickly and easily. Not only can you customize each event with images, maps, icons, colors, and more, but you can also configure your calendar to search and sort in several different ways. EventOn - WordPress Event Calendar Plugin is a really nice, easy to use event calendar plugin that also offers a unique slider addon. This calendar is much more than a calendar or event calendar. 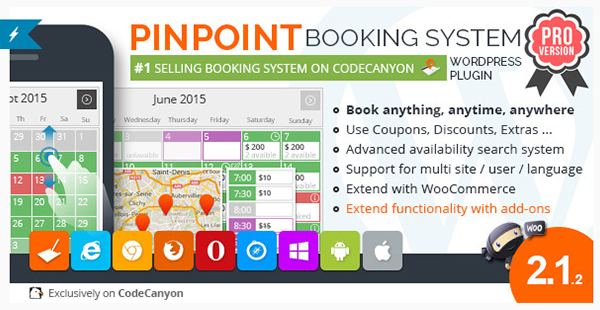 Pinpoint Booking System PRO is a complete booking system that includes the option to easily integrate with WooCommerce. Creating a booking and reservation system has never been this easy. This is fully responsive and also has the ability to set up email templates and notifications. Pinpoint Booking System PRO - Book everything with WordPress has everything you'll need to build an impressive booking system from the comfort of the WordPress admin. 3. Bookly - Book Appointments, Book Services, Book Anything! Easy and Fast Booking for Your Clients! 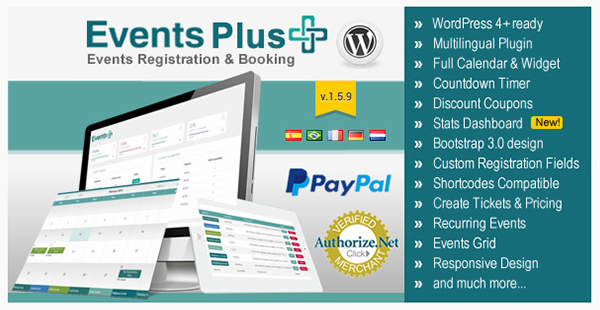 You can book and schedule just about anything with this WordPress plugin. 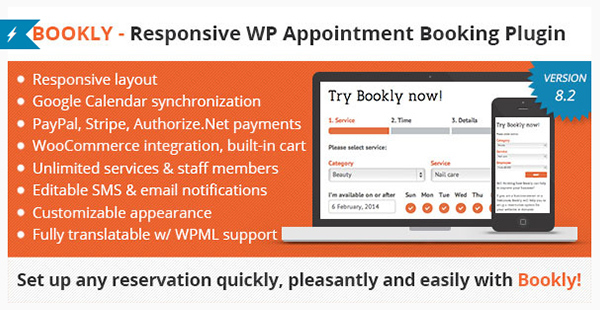 Bookly is an incredible appointment booking system that blurs the line between WordPress website and web application. This is well designed, fully responsive, and even supports gestures. Customers can book their own appointments, include personal information, and send payment. They can also cancel their own appointments via their confirmation email. There's also the ability to create schedules for each staff member—you can even block out holidays. Bookly's customization options and useful features will make it more than just a way to serve customers well, but also help the website owner keep track of staff and appointments at the same time. 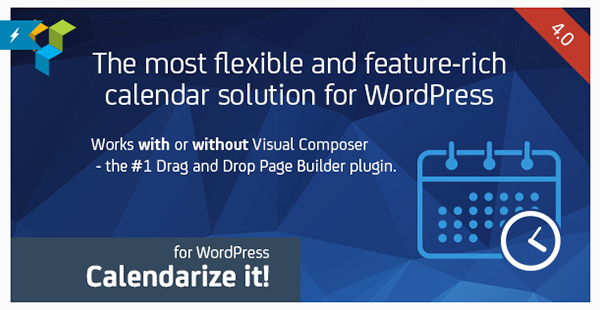 Even though this WordPress calendar plugin is built to work in conjunction with Visual Composer, it can be used just as easily on its own. Calendarize it! for WordPress is full of features that can be configured just how you like. With a very simple design, this calendar plugin can fit in to just about any design scheme or style. You can set up detailed venue pages, leverage Google Maps integration, and use it internationally with multiple languages and date formats. Calendarize it! 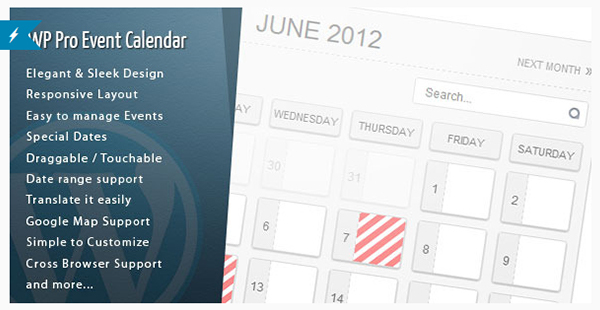 for WordPress is one of the most agile, customizable WordPress calendar plugins. There are certain features that you expect with a WordPress calendar plugin; however, there are a few that really set themselves apart. 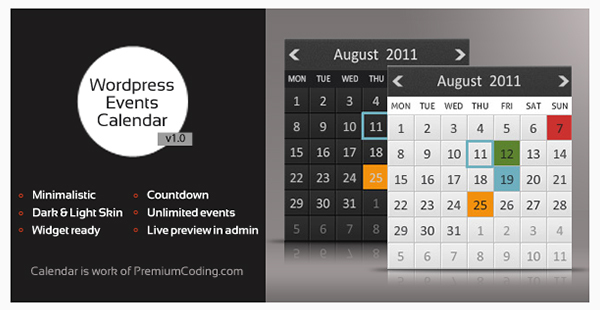 WordPress Pro Event Calendar is a WordPress calendar plugin that sets itself apart. But what really sets it apart is the ability to import events from ICS feeds and Facebook. Best of all, WordPress Pro Event Calendar accepts events submitted by front-end users, making it easy to accept user events. Here's another great option for setting up a fully functional event booking system. 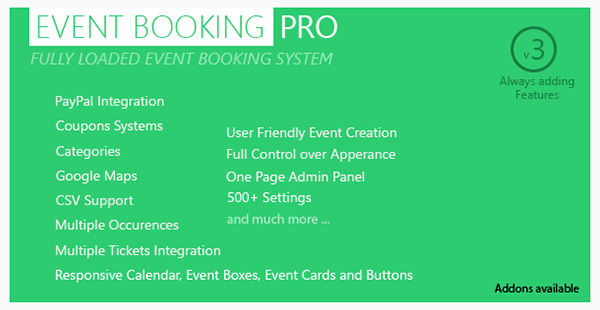 Event Booking Pro is very pro as it boasts over 500 settings! There's no shortage of shortcodes, it supports CSV, and everything can be customized and styled as you like, making it fit into your WordPress theme design perfectly. 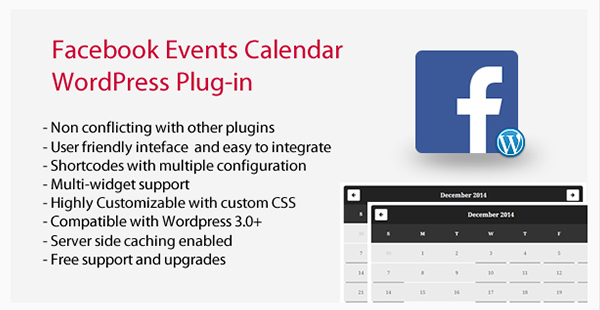 Event Booking Pro - WP Plugin [PayPal or Offline] is an impressive WordPress calendar plugin. 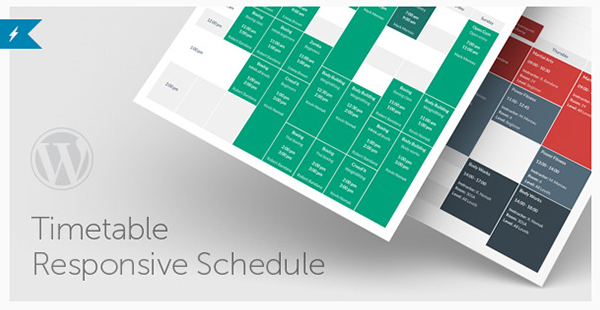 The Timetable Responsive Schedule For WordPress plugin offers a whole different look and approach to WordPress calendar plugins. Create a timetable of events easily! Use the Timetable shortcode generator to create timetable views for classes, medical departments, nightclubs, tutoring, and so on. There are plenty of event options and many different shortcode options—color picker and font configuration included. Timetable Responsive Schedule For WordPress also includes a great widget lineup, rounding out one of the best WordPress calendar plugins you'll find. Booked - Appointment Booking for WordPress is another solid appointment booking option. If you're looking for appointment booking, think about booking Booked. I really like the customer profile pages, but being able to display multiple booking agents with assigned calendars is where this WordPress calendar plugin really shines. If you are considering Booked - Appointment Booking for WordPress, be sure to also look at the Booked add-ons: Front-End Agents, Payments with WooCommerce, and Calendar Feeds. The WordPress Events Calendar Registration & Booking plugin is feature rich, offering some options you'll only find in plugin addons. Everything you need (and maybe more) for successfully setting up a fully functional registration and booking system is right here. One of the best features, for this plugin and others, is the countdown timer for all your events. Beautifully designed and leveraging Bootstrap 3.0, the WordPress Events Calendar Registration & Booking should not be overlooked. Like several of the aforementioned WordPress calendar plugins, Booki offers a full booking system using WordPress. There are so many great applications for these type of plugins, with each plugin offering a unique perspective on the appointment management process. As for the calendar itself, it displays your booking and appointment calendar with a popup, inline, and more. 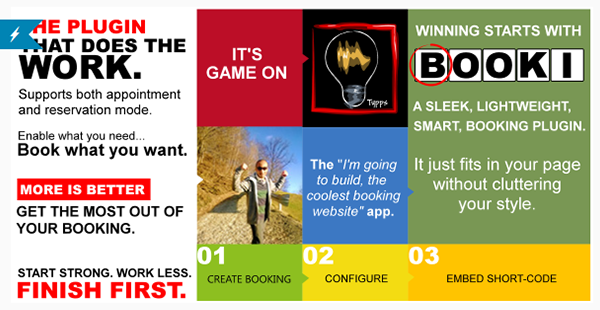 Booki is an excellent solution for booking appointments with multiple projects and service providers. This calendar plugin doesn't try to reinvent the wheel. 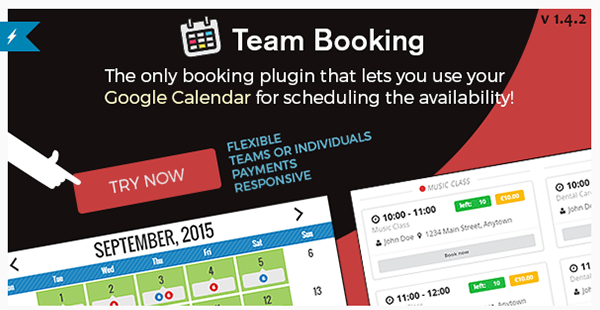 Team Booking - WordPress Booking System ties directly into something you're already probably using: Google Calendar. Most plugins have a "thing". Use Google Calendar to schedule availability. There are also a lot of nice customer features, like displaying reservations and the option to cancel their own appointments. 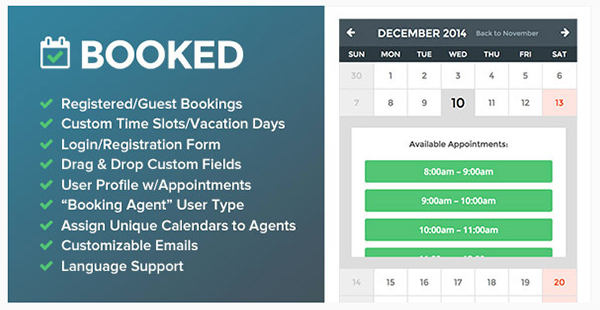 Team Booking - WordPress Booking System is a fresh take on appointment booking calendars and leverages Google Calendar to the fullest. A lot of the WordPress booking calendar plugins include a rich feature set, offering a solid all-in-one solution. WP Booking Calendar takes a much needed, refreshingly straightforward approach. With minimal configuration, you can set up available time slots, unlimited calendars, confirmations, and more. You can also set the number of days before a user can make a booking. WP Booking Calendar is simple without forfeiting great features. Not many WordPress calendar plugins offer a countdown to events. But the WordPress Multiple Events Calendar with Countdown does! The WordPress Multiple Events Calendar with Countdown adds some suspense as the timer (located just under the calendar) counts down to the next event. A timetable calendar is a great option for situations in which there are several events going on the same day. 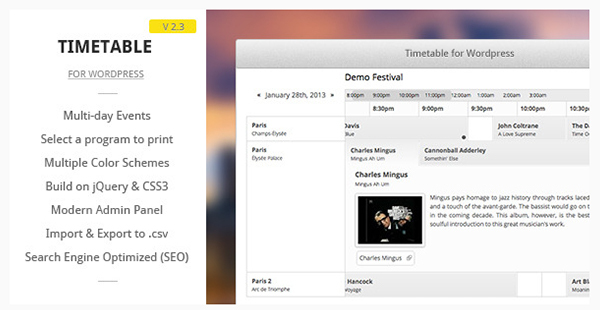 Timetable for WordPress has a nice TV guide styled approach in its content presentation. Built on jQuery and CSS3, this plugin lets you add events and modify your timetable from within its modern admin. One of the most powerful features of Timetable for WordPress is the ability to import and export timetables via CSV. Now you can edit and make changes in Excel or another spreadsheet app and import your changes and added events. You can also select which program to print, for users who prefer their schedules on paper. Most WordPress calendar plugins focus on the back end and leave most of the design to the designers. 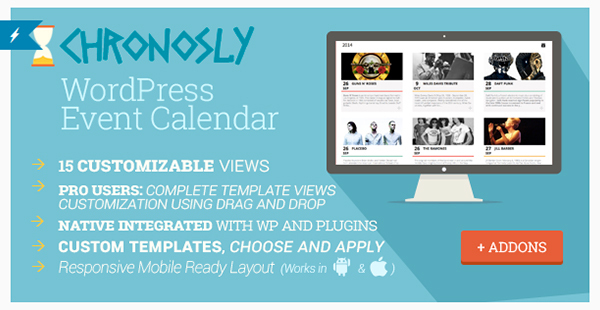 But the Chronosly Event Calendar WordPress Plugin makes customization as easy as drag and drop. This plugin is fully editable and can be used in one of two ways: basic and advanced. 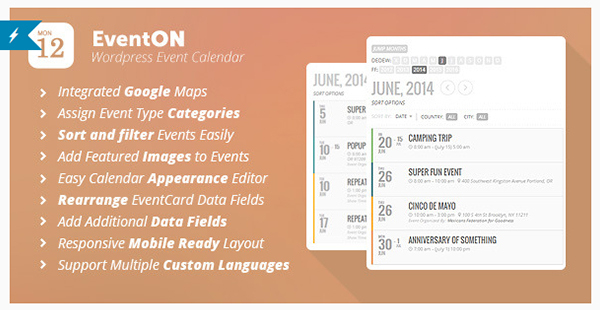 Chronosly Event Calendar WordPress Plugin can be configured and customized from the comfort of your WordPress admin. Most of the WordPress calendar plugins we've covered focus on the website user. However, the Business Calendar - WordPress Internal Calendar shifts that focus, as it creates a full-featured internal calendar for each user. Turn a WordPress install into a working platform. 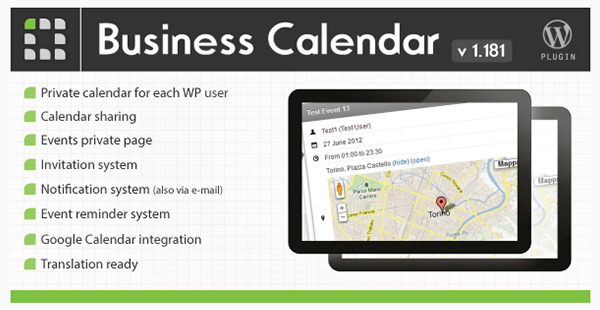 The Business Calendar - WordPress Internal Calendar is a creative approach to using WordPress like an app or full-fledged working platform. You can use a one-size-fits-all booking plugin for hotels and B&Bs, or you can use a solution built specifically for them. 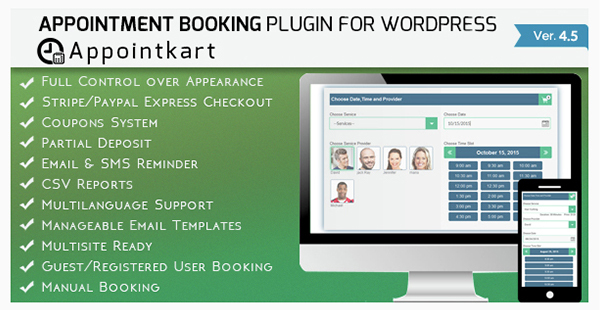 The HBook - Hotel Booking System - WordPress Plugin is perfect for anyone in the hospitality business. HBook - Hotel Booking System - WordPress Plugin has a clean design and can be configured specifically for hotels, B&Bs, and more! Just because it's a calendar, doesn't mean it has to be ugly or boring. 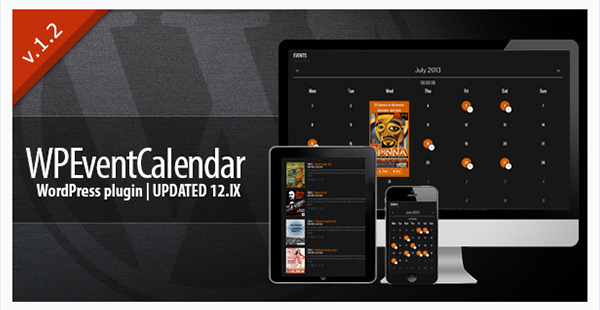 It can also be super cool and retina ready just like WP Event Calendar. WP Event Calendar is both simple and sleek—it's worth a look. Appointkart is another viable option for those looking for a full-featured appointment booking plugin. There's a lot packed into this plugin, including multisite compatibility. 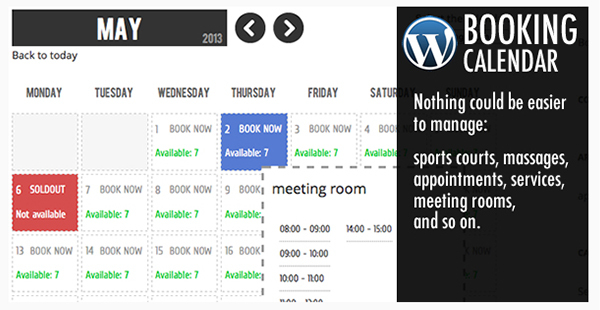 Appointment Booking and Scheduling for Wordpress - Appointkart is fully responsive and fully customizable. It also supports taxes/VAT as well as multi-languages and multi-currency. After a long list of WordPress calendar plugins, it's nice to end on something unique. The Facebook Events Calendar WordPress Plugin connects your website calendar to your Facebook Events. It has great performance, using server-side caching as well as settings to configure it. You can also choose between using the calendar date time or the browser's time zone. Facebook Events Calendar WordPress Plugin is a unique way to bring your Facebook Events to your website. WordPress has come a long way since that first default calendar widget. You can see by this list that WordPress has extended even beyond a commerce solution for brick and mortar businesses, and has evolved into a web-based tool that can be used day in and day out for all kinds of organizations. You can dig through Envato Market for more WordPress calendar plugins—and of course, if you can't find exactly what you're looking for, you could always code your own.